Biscuits and gravy casserole has all of your favorite components of a good old Southern breakfast baked into one dish. It’s great for your Southern Christmas breakfast! What are your Christmas breakfast traditions? When I was a kid, my grandmother would make an egg soufflé with sausage, eggs, and cheese every Christmas morning. It was the only time that she made it, along with Pillsbury orange danishes, and it was delicious and special. Every time I make it, it (naturally) makes me think of my grandmother. These days, my family’s Christmas breakfast consists of more typical Southern breakfast fare…biscuits, gravy, bacon, eggs, and sausage balls because, you know, Christmas. I started thinking about how I could combine all of that (sort of) into one dish…and that’s how this Southern biscuits and gravy casserole was born. As I was researching biscuits and gravy casserole, I found a common theme: canned biscuits. One recipe was made with powdered gravy. Sorry…this Southern girl does not do powdered gravy. If you want to use pre-made biscuits, that’s between you and the Lord??. Just please do me a favor and make the gravy from scratch!! I promise that it’s one of the easiest skills you can ever master, and your tastebuds (and family) will thank you. I made my own sausage, and I’ve included the recipe here. Feel free to use store-bought sausage, though. No shame. I just wanted to share my recipe for homemade sausage here because it’s gooooood. And, like the gravy, it’s extremely simple to make – just mix some herbs and spices into ground pork. Done. Biscuits and gravy casserole turned out to be everything I dreamed that it would be. 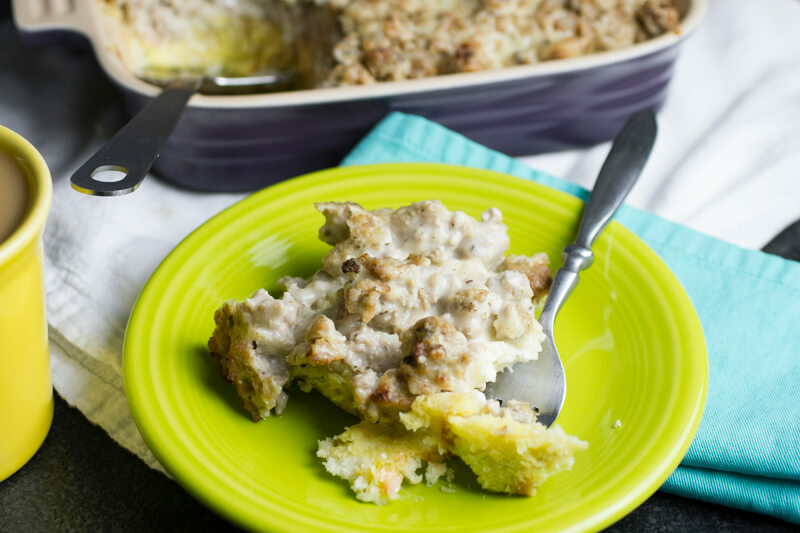 Biscuits and sausage gravy and eggs, all baked up in one-dish for the most Southern breakfast casserole you’ve ever eaten. Amen and amen. Preheat the oven to 400 degrees. Crumble the biscuits into a 9-inch square baking dish. Whisk the eggs, 1/4 cup of the milk, and the salt and black pepper together in a medium bowl. Pour over the crumbled biscuits and press the biscuits down to submerge them into the egg mixture. If you are making your own sausage, combine all breakfast sausage ingredients in a large bowl, being careful not to overwork the meat. Preheat a 10-inch skillet (I used cast iron) over medium heat. Add the sausage and cook until no pink remains and mixture is lightly browned. Sprinkle with the flour and cook for one minute. Gradually pour in the milk while stirring constantly to combine. Cook until thickened. Add salt and pepper to taste. Pour the gravy over the biscuit and egg mixture. Set the baking dish on a sheet pan. Bake for 30 minutes until the eggs are set. Serve immediately. Click here to print the recipe for biscuits and gravy casserole! What’s better than cheesy tortellini with fresh antipasto ingredients? These tortellini pasta salad has all of those components in one bowl. It’s perfect as a main dish or as a side to serve at your next picnic or cookout! Pasta salad used to be one of those foods that I just did not like. I honestly don’t know what it was about them, unless it was the fact that to me, pasta was something that should be served hot. Also, my mom really never made pasta salad so most of my experience with pasta salad was creamy pasta salads on salad bars that had so much mayo that you could not distinguish their individual ingredients. As an adult, I’ve discovered a love for pasta salads, though. It could be the fact that they are ridiculously easy to make. It could also be the fact that they are ridiculously easy to serve. I mean, what’s not to love about a cold salad that you just grab from the fridge and dish from the bowl? The other clear advantage to pasta salads is their adaptability. The pasta salads of my youth were mostly “macaroni salads” (including my grandmother’s macaroni salad, which I honestly do not remember her making but it is delicious). However, pasta salads are definitely NOT limited to macaroni, nor are they limited to only creamy dressings. A few years back I discovered a chopped salad on Smitten Kitchen that was inspired by the ingredients of an Italian sub, one of Philip’s very favorite sandwiches. The salad was hearty and did not disappoint. Every time I buy the ingredients I will eat the salad for at least a week. I wanted to make something along the lines of that salad but with pasta instead. A tortellini pasta salad seemed to fit the bill because I❤tortellini. I mean, cheesy stuffed pasta, right? This antipasto tortellini pasta salad is infinitely adaptable. I’m not Italian, but as I was researching antipasto ingredients it certainly seemed like there were few rules. 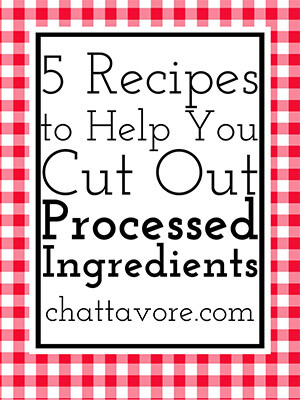 You can use what you have on hand and it is definitely going to be delicious. I used salami, pepperoni, mini bocconcini (mozzarella balls), sun-dried tomatoes, kalamata olives, artichoke hearts, a sprinkle of basil, and a tart vinaigrette. Roasted red peppers, chickpeas, prosciutto, marinated mushrooms…there are lots of delicious things you could toss in there. Just let it chill in the fridge for a bit and you have a perfect tortellini pasta salad! Whisk the vinaigrette ingredients together in a small bowl or shake together in a small jar. Rinse the cooked tortellini with cold water and allow it to stand until cooled, shaking the colander occasionally to drain the water away. Combine the cooked tortellini in a large bowl with the remaining ingredients. Pour the vinaigrette over and toss to combine. Cover and refrigerate until ready to serve. The salad will keep covered in the refrigerator for 4-5 days.